Do you have any kitchen quirks? What about your partner or roommates? Maybe you are wondering what I mean by a kitchen quirk. Basically it’s anything that drives your significant other batshit crazy. I like to think of myself as a recipe creating tornado and I frequently drive Eric nuts because he is so much more organized than I am. When you are with someone for almost 15 years you learn every one of their little (and big) quirks. Day by day….by day. Want to know what Eric’s biggest kitchen quirk is? Aside from me, it’s the dishwasher. The guy has a thing for dishwasher organization. It’s his pride and joy. And it’s actually impressive, the dedication that he puts into carefully loading and stacking the dishwasher every day. He has refined his technique over the years too, always improving. Impressive. At first glance, you might think that he’s just a normal guy unloading or loading the dishwasher, but you’d be wrong, very wrong. He is not normal. Eric has been trying to enlighten me with his genius dishwasher short-cuts ever since we got together. I stubbornly refused for years until I recently discovered how amusing it is to see him so proud when I use his “tricks”. He beams with pride. My sister was over yesterday and after dinner we got talking about how her husband/my brother-in-law insists that the dishwasher is loaded in a certain way. Hmm sounds familiar. So began a hilarious conversation with us and the guys talking about how a dishwasher should be loaded. She said, “Steve will actually UNLOAD the dishes that I have loaded and then reload the machine!” Well, that rings a bell. I hear Eric tinkering away with unloading and reloading my dishes every night. He also has a system of loading my measuring spoons (because I typically use about 20+ on any given day of recipe testing). We have a dishwasher with a narrow top tray for cutlery and he has created this whole system of how to load the measuring spoons and other utensils so that they don’t collect/pool any water…right down to which direction they face for optimum drying. Like I said, not normal…but impressive. I should also mention that we had a 10+ year ongoing debate about whether ketchup should be refrigerated or not. I said that, yes, ketchup should be refrigerated and he always said it shouldn’t (just a personal preference on his part). One day I pointed out the label which reads “Keep refrigerated” and it’s been in the fridge ever since! Case closed. Mystery solved. He finally gave in (even if it’s perfectly fine at room temperature). Of course, this story wouldn’t be complete without Eric weighing in on my biggest kitchen quirk. Nailed it. Martha would so not approve of my kitchen ways. Ok, it’s your turn to spill the beans. What are your kitchen quirks? What about your partner or roommates’ quirks? This homemade chocolate is made with just a few essential ingredients - virgin coconut oil, cocoa or cacao powder, and pure maple syrup. (Feel free to use whichever liquid sweetener you prefer). The virgin coconut oil replaces the cocoa butter found in traditional chocolate so while it needs to be kept in the freezer, it’s a great way to sneak some coconut oil into your day. You can also use any toppings you'd like - dried fruit, nuts, + seeds all work lovely. It melts much faster than regular chocolate, so be sure to keep it chilled until ready to enjoy. I prefer it straight from the freezer. Preheat oven to 300F. Line a 9" square pan or a small baking sheet with two pieces of parchment paper, one going each way. Set aside. Add hazelnuts and almonds on a baking sheet and roast in the oven for 10 minutes. Remove baking sheet and add the coconut flakes and spread out. Continue roasting the nuts and coconut flakes for another 3-4 minutes, or until the coconut is lightly golden. Watch closely to avoid burning - coconut burns fast! Place hazelnuts on several sheets of damp paper towel. Wrap the hazelnuts and rub them vigorously with the paper towel until the skins fall off. It’s ok if some skins don’t come off. Discard the skins and roughly chop the hazelnuts and almonds. In a medium saucepan, melt the coconut oil over low heat. Remove from heat and whisk in the cocoa (or cacao) powder, maple syrup, and almond butter (if using) until smooth. Add a pinch of sea salt to taste. Stir in half of the almonds and hazelnuts. With a spatula, spoon the chocolate mixture onto the prepared parchment-lined pan or sheet and smooth out until it's about 1/4-1/2 inch thick. Sprinkle on the remaining nuts and all of the coconut flakes. Place into freezer on a flat surface for about 15 minutes, until frozen solid. Once frozen, break apart into bark. Store in the freezer until ready to eat. I don't recommend keeping it out on the counter long because it melts fast. Tip: To make this nut-free, simply omit the almond butter, hazelnuts, and almonds. It will still turn out just fine! You can try adding toasted sunflower seeds on top for a little crunch. My boyfriend is the exact same way with me and the dishwasher. Without fail, every time he goes to unload it after I have loaded it he exclaims in frustration, “This is isn’t how I told you to do it!” Maybe it’s a guy thing? Strange obsession to have for man that doesn’t seem to care that much about the cleanliness of the rest of the house! 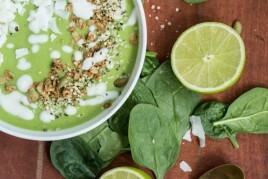 Check out http://juiceandfeast.com for more great recipes! I have got to try this chocolate bark! Coconut oil is the BEST! 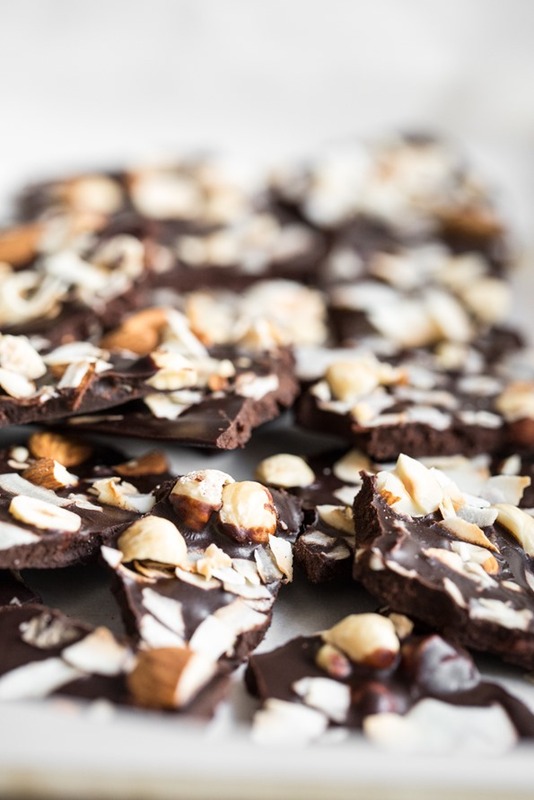 This chocolate bark looks marvelous, like these florentine almond/chocolate cookies we always order at our special restaurant (the place where I proposed to my wife). My biggest kitchen quirk, oh my, my wife and the recycling! We are big recyclers and she just throws all our recyclables on the floor next to the garage inside the house! The floor I have you, for me, apparently the bottle fairy / recycle fairy to pick up. But I forgive you because you always clean up the cat puke and change the litter box. my kitchen quirk; stacking the dishes that we hand wash a “certain” way for optimum drying and space-saving. we hand wash pots, pans, cooking utensils, sharp knives, and my lunch dishes since I use them everyday. i go batty if they are not stacked “correctly.” i also get irritated when things are not put back they way they were found. My husband is terrible at this. when he puts away clean dishes i can never find anything! i once had to search for 30 minutes for my rolling pin only to find it in the aluminum foil/saran wrap/sandwich baggie drawer after a desperate phone call to him. …oh and he also likes to put every single piece of silverware in the first slot because i mean there aren’t like 10 others. There are kitchen quirks in this household. I definitely don’t get picky about cleaning though, as I am usually just glad to have some extra help. One major thing my husband does (did actually! haha) was use SO MANY cutting boards. And knives. Like separate boards and knives for each stage of the cooking process. It was maddening! But we have both moved past it. :) I’m not totally sure what my quirk is, which probably means I do multiple weird things of which I am completely unaware. I’m cracking up reading this. I don’t tighten the kids on containers all the way, put the stickers from veggies in the cutting boards and am pretty chaotic as well. I just get into my creative place and things go everywhere. Love that your hubs is all about the dishwasher I try to be good at it but I’m not. Lol. Love love love this chocolate bark!! My kitchen quirk: dry sponge. do not leave a wet, full of water, pick up and it’s heavy from water, sponge. it collects germs. I constantly want to put a sign up that says “A dry sponge is a happy sponge” That is truly my only quirk. OMG the wet sponge thing drives me nuts too! It’s so gross and even starts smelling after a day! Yuck! Have you guys tried the norwex dish cloth. I LOVE it and it’s design allows you to leave it in a ball in the sink and it does not smell. OMG that’s hilarious! I love The Oatmeal. My husband also unloads and reloads the dishwasher any time I try to do that. My own biggest quirk is that all the jars for dry goods have to “match.” So no leftover mustard jars or anything like that for seeds, nuts., etc. Lentils and all the types of dry beans have to be in a certain size container; quinoa, millet, barley, etc. have to be in a certain type; oats, flour, sugar have to be in a certain type – you get the picture. Also matching mason jars in the fridge hold nuts, seeds, and spoil-prone things. My husband is also driven completely insane that I have sourdough starter on the counter so often. You sound just like me. My guy cleans the kitchen, and I…well, I demolish it. My friends have always joked that I leave a trail of destruction in my wake wherever I go–even though I try to be neat! I really do! My husband leaves a water glass on the counter beside the fridge, yet can never remember to refill the Brita. Not sure how quirky that is but it annoys the crap outta me. I’m in love with this recipe and I haven’t even tried it yet! Ooooh! I need your hubby to come to my place and organize my dishwasher every night. Organizing cans so all the labels are facing forward and lined up is normal not a quirk, right? The bark looks tasty. I love that you threw some almond butter in there. Everything is better with a spoonful of almond butter, after all. Wow I wish I had a dishwasher to have packing problems with! My fiancé has a lot of issues with stuff I do, like not fully rinsing (washing) the dishes before I stack them to be washed, and other things like that. I personally can’t stand when he opens a cabinet — and leaves it OPEN after he is done? How could you forget to shut a cabinet? More than once? Ever??? These look amazing, can’t wait to make them! LOVE that you included hazelnuts in this!! They are my nut of choice with chocolate so I can only imagine how amazing this is! This is too funny – earlier today my husband and I were debating about which foods to put in the fridge! My husband leaves random kitchen cupboards open (just the upper ones, never the lower cupboards). It drives me nuts. I’ll hear him open and close, say, 4, cupboards, then I’ll go into the kitchen later and find that the one on the end is wide open. Why?! Who does that?! See the story I posted lower down. You might get a kick from it! So do I! I don’t know why, but taking the extra second to close them doesn’t even cross my mind. When I’m cooking something, it’s very common for at least 3 to be open at once lol. Oh man, this looks so darn good! I need a chocolate fix, and this will definitely do the trick! I really enjoyed this post. I once read a book (unfortunately forgot the title) that stated, the only reason we live with others is to keep from getting too many odd quirks as we get older. Your chocolate recipe sounds amazing. The roasted nuts look great. Really nice recipe! I will for sure try to do something similar! 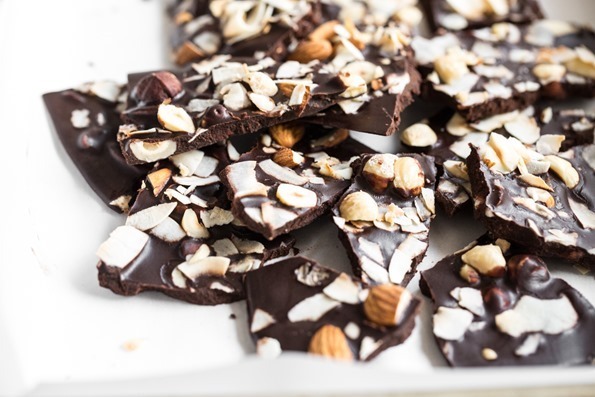 MMMM yes, I love recipes like this – chocolate bark is so darn delicious and tastes amazing! Oh quirks…love them! Mine is having a “strong desire” (ha!) to ensure the kitchen is clean before heading to bed as I find it too over whelming to look at the chaos of teenagers in the morning! My husband seems to have the “leave the kitchen door(s) open” syndrome many have described and has passed this on to our teenaged boys…a sure fire recipe for driving the lone female in the house nutty! Bark was awesome Angela, thanks for sharing. This is so funny! In our house it’s the other way around. I am very very organised and my husband is like ‘chaotic’. I have a thing with the dishwasher as well. I drive my husband crazy with it. And still he is kind enough to now and then fill the dishwasher for me. Just last night he was and I was sitting at the table watching him. I know I’m awful and I try to keep my mouth shut, but I just can’t :’)… And then when he goes upstairs I try to silently rearrange hahaha. I also have everything in my cupboards labeled and in a certain place. My spices have there own drawer and the are in alphabetical order….. Just last week I asked my husband to get me a certain spice and I said ‘ you don’t have to worry, they are in alphabetical order, you’ll find it’. He made this face, rolled his eyes and said ‘of course they are’…. I enjoyed your post so much I haven’t even looked at the recipe haha. That’s so funny about the dishwasher quirk. My husband is the complete opposite and I’m always having to reload the dishwasher when he puts his dishes in. I’m all for optimum space to make sure everything gets clean and he just likes to put things in the first free spot that he sees – usually without even opening the door all the way! If I had to guess my quirk, it’s that I like our dishes and bowls to be stacked a certain way in the cupboards. Small cereal bowls on top, larger bowls at the bottom, etc. It drives me nuts when I see them mixed up! I once caught my husband rolling his eyes at me while I rearranged the cupboards after he emptied the dishwasher. Love this! Totally gonna make this! Hilarious! I love this post!! Gah! That drives me crazy! Or he stacks everything in the sink instead of to the side so that I then have to move it all to wash. I also only like to clean up once a day because I don’t want to live in the kitchen and feel that it wastes a lot of water. That said, there are only two of us. However, you’d think 20 people were eating here… When I cook, all of the veggie drawers and half the fridge come out because I make everything from scratch and often experiment. It definitely looks like a kitchen tornado has come through. As for the dishwasher, well, we just disagree. It also drives me nuts that when he does the dishes and “cleans” the kitchen, he’ll do ALMOST all of it – usually doesn’t wipe the counters or table and it drives me insane! Seriously, he is a wonderful man. Funny story. I am probably a chaos cooker and it doesn’t bother me to have things a bit out of place. Including cupboard doors (overhead ones, not at shin level. ouch). It drove my husband crazy, when we first got married, that the cupboard doors were left open. He repeatedly would ask me to close the doors. So one day, on my way out of the house, I opened EVERY SINGLE CUPBOARD! Apparently, when he first saw it he didn’t get the joke and was a bit pissed off that they were all open. Then he realized that they were ALL open and it must be a joke. We laugh about it now and I have since gotten better at closing the cupboards. My husband did that to me once. He’s notorious for leaving open drawers, doors, cabinets, etc…. I walked into the kitchen one day and he’s sitting at the table eating something reading the paper with every single cabinet door and drawer open. All I could do was laugh. I look at this way – it’s his way of always keeping his options open – you know the saying, when a door closes, a window opens. Well, he’s just reinforcing this. My quirk: do not put in the dishwasher what I will need the next day (measuring cups, handheld cheese grater, cutting board etc.) I do not have more than one of these, and I hate when I have to stop and wash something while I’m in the middle of cooking. Too funny! My husband & I have our own quirks, too. We have actually struck a deal… he will abide by my rule that the dishtowel must be NEATLY hanging (not shoved in a clump) on horizontal oven handle. In return, if I’m doing dishes alone, I will dry the knives & put them away immediately instead of allowing them to air-dry. He his convinced that allowing water to sit on them is bad… that sounds silly to me, but in the spirit on compromise, we stick to the deal! Thanks for the funny read & the yummy-looking recipe! This looks so delicious! It was life changing for me to learn that you can make chocolate out of coconut oil, but I hadn’t thought of doing bark. I tried replacing the sugar/syrup with stevia and it actually turned out amazing! Latest post: Hips Don’t Lie! 3 Quick Moves to Keep ‘Em Fit for Life! I am just like Eric! It drives me CRAZY when people load the dishwasher inefficiently. I used to have the worst roommates who would only half fill the dishwasher and then run it, or put in things which really shouldn’t go in (like cast iron frying pans! who does that!). But the most I have ever been angered by someone else’s lack of kitchen etiquette was by this boyfriend of my ex-roommate. When he ate peanut butter on his toast in the morning, he would leave the knife lying around covered in peanut butter! He didn’t wipe it off on his toast (like a normal person), but just left his knife on the counter with peanut butter all over it. To this day, I feel genuinely angry when I think about it. If I substitute cacao butter, will it stay solid at room temperature? And how would you recommend doing that? It seems like everyone is in one of two camps: AMAZING at loading the dishwasher or TERRIBLE at it…quite amusing! My husband is in the latter camp, and I sometimes catch him putting something in there (in the worst possible place) and then running away before I can see him…like I wouldn’t notice later anyway! I second another commenter about the sourdough starter, along with sprouting seeds, soaking beans and nuts, rising dough…all of that stuff drives him crazy. The best way to win out on that argument, though, is to just threaten to stop cooking all together. You have the upper hand if you’re the one with the kitchen skills! Oh man, the comment about ‘chaos’ made me laugh out loud. I get the exact same comments from my boyfriend all the time, he calls it the foodie explosion. Every inch of counter space, and floor space is ruined when I cook. He usually leaves the area when I cook and comes back just in time to eat whatever i’ve made ;) I am also fairly neurotic about my pantry, and often reorganize it every month. Which drives him nuts because he can never find anything. Haha I must be hard to live with! Thanks for the recipe, can’t wait to try!! That does indeed look crazy good! Oh I am chaos when I cook too. I wish I was more organized and cleaned as I go, but I just can’t. My husband (and my children) have a couple of quirks that drive me crazy. Leaving cabinet doors open is the worst. I just don’t understand it. I walk around closing them in the kitchen and bedroom all the time. Also, leaving used paper towels everywhere. Hello trash! The quirk my husband hates is when I put an empty egg shell back in the carton. I have no idea why I do that. I have tried to get better. My husband also has a thing w the dishwasher. It used to be a point of contention until I reminded him that Im the one who does the dishes and if he would like to take over, then by all means please do. It was little things like which way the silverware pointed in the dishwasher (always down for me). Too funny! This made me laugh! I also have a very specific way of loading the dishwasher and it HAS to be that way! The thing that bothers him is that I don’t follow his fridge organization and always put Tupperware on the “Drink” shelf. This looks so yummy! 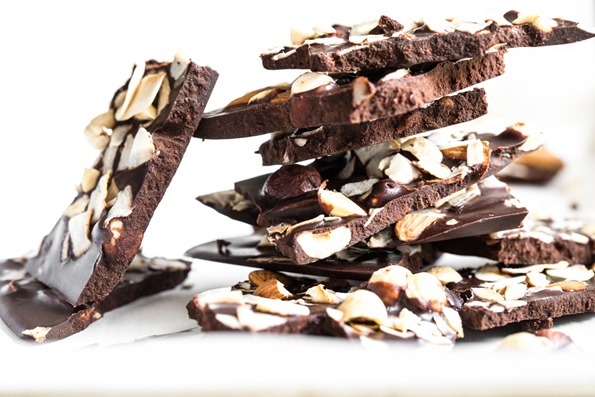 It seems like the whole blogosphere has boarded the chocolate bark train lately – I’m going to have to grab a seat or be left behind on this delcious looking journey. Great work! Thinking I’ll try it with crused up peppermint candies since I can’t eat nuts…can’t wait to try this! My husband calls me “Tammy Tornado” when I get going in the kitchen. (My name isn’t Tammy). One of my quirks is the stacking of dirty dishes to be hand washed. I like them to be all positioned just so. My “type A” personality won’t allow them to be scattered about the counter. It drives me crazy…My husband couldn’t care less. For him, me throwing dirty dishes cloths down the basement stairs and having a full recycling are his quirks. He empties it pretty much every day and always complains when it magically fills up so quickly. My boyfriend is the same with the dishwasher!! That’s so funny. He will actually unload it to load it ”better” as he says I know nothing about loading the dishwasher…and shakes his head. It drives me nuts when my family piles stuff all over my kitchen island. No one puts stuff away after they use it and my husband uses it to dump whatever is in his hands when he comes in from the garage. If there’s little real estate left he will just push what’s there to the center until I literally can’t see the counter. And I have a huge island. Empty pizza boxes from my boys, spices not put away. Opened mail, flyers, magazines. Blenders/food processors that need to be put away. Book bags, homework, dirty gym uniforms. And guests! They are the worst offenders. I’m cooking dinner, they come in with their contributions, purses, hats, gloves and plop it goes in the middle of my island (not to seem ungrateful). I’ve started locking my garage door so they have to come to the front door and I can head them off at the pass before their stuff winds up on my island. Thanks for providing me with an opportunity to vent! Chocolate and coconut oil is a match made in heaven. You know all the usual controversy over coconut oil with its saturated fat content… Have you ever written a post on that? About your pro-coconut oil stance? I have lots of kitchen quirks.. shall we discuss over some chocolate bark!? ;) The dishwasher story reminds me of my grandpa who used to ALWAYS have to reload the dishwasher himself, no matter how I put dishes in. I’m sure his reasons were nowhere near as practical as Eric’s though – I think he just enjoyed having it as something to do! As for my quirks, I always use the same knife for cutting pretty much everything, and I have a bad habit of re-using my dishes from the dishwasher if I didn’t get them that dirty during their last meal. I know, it’s gross! I bought something similar to this a while ago and tried to replicate it unsuccessfully. It’s the coconut oil that I was leaving out!! I can’t wait to try this. Making a mental note to gift this for Christmas this year!! Thank you! Don’t know whether or not you got the comment I left the last time but I love your blog! I’m from Ireland and am surprised that most of your followers appear to be Americans – I must start telling more people about ohsheglows! Just wondering if you had ever thought of posting a paleo raisin cookie? I’m also looking for a caramel shortbread recipe without nuts or refined sugar. I really adore your recipes. Haha, Angela! You seriously CRACK me up! We all have our funny kitchen quirks but the produce sticker one is one to remember!! I feel like I have a lot of kitchen quirks my biggest one is probably CHAOS too. LOL the kitchen always looks a tornado by the time I’m done a big meal! 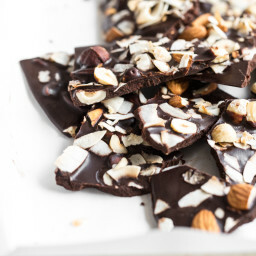 And this Coconut Oil Chocolate Bark looks all kinds of amazing! YUM! I am literally cracking up reading this! My husband’s kitchen quirk (also a computer programmer… hmm) is keeping the dirty dishes in the sink “organized.” Super weird. If he goes to do the dishes after I’ve cooked and they are too “disorganized” (read: they usually are) he will often refuse to do them until they are organized! It seriously drives him insane when the plates/ cups are not stacked properly in the sink. Mine is when someone does the dishes but doesn’t do ALL of them. Like, only the big pots and pans and then leaves the rest dirty on the counter in the way of my kitchen electrics. OMG makes me rage lol. I absolutely have to have a clean and organized kitchen! Baking is my passion and by the time whatever I am making is in the oven, you could not tell that anyone has been in the kitchen. I also hate, HATE crumbs or spills on the counter-top – however, whenever I make the kitchen all pretty, the man gets the munchies and I’m back to square one. But I’ll deal with it because he always does the trash and vacuums! Oh, the produce sticker post. It showed that we’re not all crazy, it just MAKES sense sticking them to the sink instead of throwing them away haha. Confession; I hit the print button directly from my phone and pulled the nuts and coconut out of the pantry on my way to the printer. Got so excited to try another OSG recipe and it might have just a little to do with the fact I haven’t had chocolare this week yet!? Can hardly wait for the 15 min in the freezer. Thanks Angela:) love the variations and potental variations. I confess a small pinch of fleur d sel on top. I totally hear this! Mine is that I can’t leave dirty dishes in the sink, it drives me NUTS. My fiance on the other hand leaves a tornado in his wake, with doors open and crumbs trailed on the countertop. Oh well, we all have our quirks, right? This bark is perfect Angela, a little bit of all the good stuff! We just ate this and it is very good. Easy to make. Mine is not standing when people pile dirty dishes into the sink. When I wash dishes by hand I stack them neatly on the counter next to the sink and then wash them over the sink one at a time. My mom’s worst is that she will put everything she sees sitting on the counter (any fork, knife, glass of water) into the sink! Even if I had just been using it a few minutes before and was going to continue. Then to me its already dirty from sitting in the sink so I need to rewash it. Haha I normally don’t complain about these things but its nice to vent. This looks so good! My kitchen quirk (besides the unholy mess I make) is that I leave all the cabinet doors open. I’m not sure how this started, but my husband teases me about it all the time! Ha ha ha….produce stickers! Yes…I remember back in the day when you and Eric would placed produce stickers on each other’s shoe/shoelaces. So funny!! I go through an absurd number of towels and dish clothes in the kitchen. I’m forever walking away with a towel slung over my shoulder, only to abandon it somewhere else in the house. I do, however, excel at Dishwasher Tetris and will reload dishes my husband has put in if I can put MORE dishes in there. As a fellow dishwasher reorganizer, I understand this situation completely! I mean, how else are you going to get all your dishes in there with maximum efficiency and no random cups left out in the sink? I ask you. 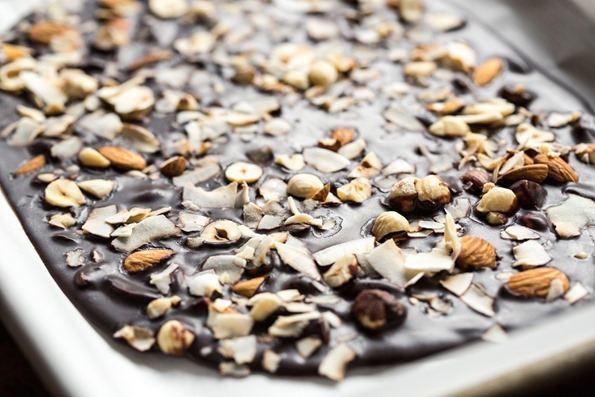 :) This chocolate bark sounds great — so full of tasty nuts! Yay! Looks so delicious. My husband is lactose intolerance, dairy milk chocolate is a big no no for him. I will definitely try this sooooonnnn. Thanks so much for sharing. As for me, it’s creating clutter with my computer, books, notes, etc. all over our tiny counter space while cooking! Oh my this was SO funny to read I actually laughed out loud. My dad will UNLOAD the dishwasher too to reload it and has been doing it since I was little. It’s almost comforting when I see him do it when I go home now to visit! I’d have to say my biggest kitchen quirk is keeping everything in the refrigerator in the same place every time I buy it, like I never ran out. Weird, but it works for me! Great post!! Sounds and looks fantastic! I’m going to make it this weekend! This sounds so yummy! The dishwasher business is such a kitchen quirk for me. I’m the one who has to load it just so. My bf is afraid at this point to load it….he knows that if he does, I’m just going to re-do it anyway! The silverwear is where I really do get a bit nutty. Forks must go with forks, spoons get segregated, etc. It just makes unloading it so very much easier. I can unload the dishwasher in record time! Haha I do the same thing with produce stickers! Also sometimes I find them stuck to my socks or in my hair or other weird places. Does Eric clean your recipe testing dishes??? That is true love! There is definitely no color coordinating of pantry items or labels facing the same way, etc. I would say it’s organized chaos. Same with the fridge. I don’t really know what my kitchen quirks are! Chris definitely is cautious of our good cutting knives being placed in the sink for long periods or time because they can rust and break more easily with other dishes stacked around them. I try to stay on top of the knife cleaning when I’m cooking so we don’t have any casualties. ;) I will say all of the photography props drive Chris INsane. He never knows where anything goes, haha. I really don’t think I am super particular about things in the kitchen and I don’t have set ways on organization. Keeping the kitchen clean is hard enough! Mine is people leaving recycling stuff on the counter when we have a cabinet for it. That – and bottle caps not being thrown away – such simple things that make a huge difference in how clean the kitchen looks! This kind of reminds of me of your carob almond butter fudge – do you think I could sub in some carob powder? I used a combo of raw cacao powder and carob powder for the fudge and it was ahhmazing…exactly the thing a pregnant lady needed. 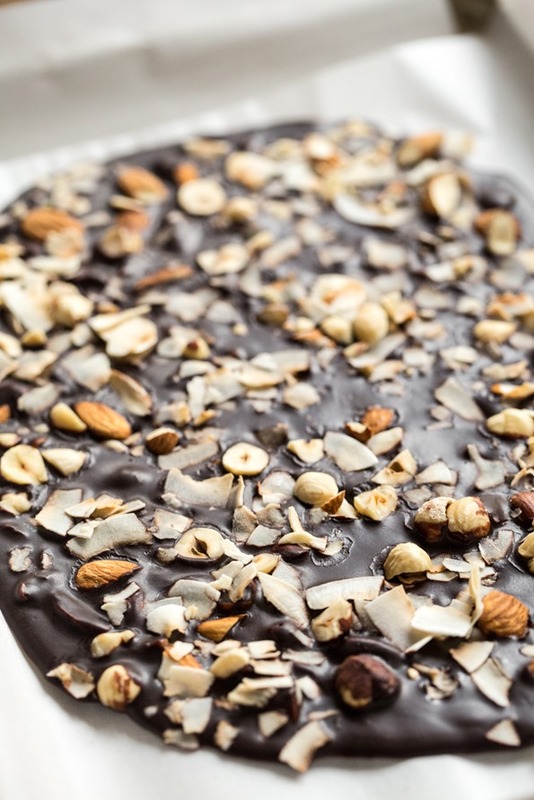 Now I’m not pregnant, I think this almond bark is just what a new mama needs! Oh my god I am like, obsessive about my kitchen counter when I am cooking! I clean it ALL the time and i also do the dishes as I go because I CAN’T STAND a full sink when I am working. But my boyfriend…. he is all about those crumbs. He leaves crumbs eeeeverywhere all the time. Sometimes from things I didn’t even know could make crumbs! Ahaha it drives me nuts but it’s still worth it when he just wants to prepare a dinner for me. These bars look awesome! Gonna try that this week-end, thanks for the recipe Angela! My boyfriend always leaves empty wrappers and containers on the counter. One time he left the lid of an empty jar on the counter for days. I, of course, noticed it the day he first left it there and decided to wait and see how long it would take for him to throw away. A few days later he was making dinner and the lid was still there. It was in his way, so rather than pick it up and throw it away in the trash can 3 feet away, he moved it to another counter! I wavered between annoinace and amusement for a second, and then couldn’t help myself, I burst into laughter. We got a good laugh out of it. This looks so good, Ange! I used cacao butter instead of coconut oil. Ok first time commenting here but I just have to add my two cents because Eric and myself are clearly two peas in a pod! I don’t even let my husband near the dishwasher anymore because I have never seen someone load a dishwasher so inefficiently in my life! I was spending more time unloading and reloading the dishwasher than if i had just done it myself the first time so he has taken on other duties and stayed far out of the kitchen and even further away from the dishwasher. And its just so funny because of the two of us he is by far the more organized one – one look at our bedroom will clearly demonstrates it. His side is neat as a pin, nothing but a little travel alarm clock on his night stand. Mine? You can’t tell if there is an actual night stand there or just a massive pile of books with an alarm clock, kleenex box and iPad precariously balancing on the pile. So it shocks me how disorganized his dishwasher loading is. Unitl my MIL came over one day and took it upon herself to load the dishwasher for me. Then I knew…its genetic!!! Lol oh this looks soo good! My kitchen quirk would have to be the way I stack the dishes in the drying rack (we don’t use the dishwasher as often cus it is really old and doesn’t get them very clean). When I’m done doing all the dishes, our drying rack looks like the leaning tower of pisa :P. I’ve got it down to an art being able to stack and unstack everything but when he goes to try and take something off, the whole pile comes tumbling down lol. Quirks are definitely eating standing up and out of pans. I almost never plate my food. Which is how I am planning on enjoying these bars! Do a post on his tips I would like to hear them! Will earth balance work with this recipe? I don’t use coconut oil..
Oh good lord, where do I begin??! Dishwasher-I want the spoons all in 1 section, forks in another.etc. makes unloading so much easier. Also there are things I will not put in the dishwasher-my measuring spoons & cups & wooden spoons because I use them all the time. Ok, unloading groceries I put all the refrigerated stuff in 1 area, frozen stuff goes into the freezer right away & cupboard stuff in another area so I only have to go to that area once with all the relevant stuff. This was super delicious; I used coconut nectar instead of maple syrup because one was on sale and the other was not. Yum! YUM! This looks amazing, thanks for sharing, can’t wait to try. To my parents horror- I will absolutely refuse to wash the dishes NOW when I know I am just going to have to wash up the baking trays (currently in the oven) in 10 minutes. Yes- I am doing nothing now. But NO- I am not doing two loads needlessly! I laughed all the way through this post because it is exactly the same at our house! I stick the produce stickers on the counter (I didn’t know anyone else did that – lol), dirty up every dish (so it seems to my husband), and I drive him crazy with the way I load the dishwasher all willy nilly. He is very particular about that as well. And about this chocolate bark, def making it! Yummmmm…Looks amazing! Made this bark tonight and it came out perfectly AND it is delicious! I feel so wicked eating it and smiling because I know exactly what’s in it. This will be a staple in my freezer! Is there anything that’s original on your site? Every recipe seems a copy from another blog. There seems to be no authentic creativity on your part. It sounds super good! Ingredients that I love! It gives me a lot of ideas! Thank you! I made this last night for a dinner party and it got gobbled up in no time – every last crumb! It was delicious. This is probably the twentieth recipe of yours that I have made (I got your first cookbook for my birthday) and I have loved every one. About to try number 21 today (pecan pumpkin butter). I just wanted to say thank you for creating such healthy, inspiring, and accessible recipes. Haha for us it’s the dishwasher also! As well as recycling. I like to keep the recycling on the porch in a bin but he always put things to recycle RIGHT NEXT TO THE SINK. I don’t know why but it frustrates me having empty bottles next to the sink. Haha still love him to death though. Happy Spring Angela! Since Easter is approaching, and i am newly betrothed to a vegan lifestyle, one thing that i miss terribly is a festive egg bread with maybe some dried fruits that was always included in my traditional upbringing. Any chance you may post something like holiday vegan bread or rolls ? Would love it immensely…. Okay, so I’m the one rearranging the dishwasher. My DH will unload it but after 15 years, he just piles the dishes on the counter above the dishwasher so it only has to be loaded once. LOL He also leaves crumbs everywhere. I can walk into the kitchen and tell you that he had toast and how many pieces he had by the crumbs he leaves on the end of the island. He is an incredible sous chef and chops all the things for me, preps ingredients and such because my biggest quirk is I have a terrible propensity for sharp object accidents. I get in a hurry and injure myself so he takes it upon himself to do the chopping/shredding/etc. For that, I’ll clean up his toast crumbs. Loved this post so much – hilarious!! Also, by far the BEST OSG dessert I’ve tasted yet! Thank you, Angela!! Cannot wait for cookbook number 2!!! Made this last night and I’m blown away at how easy it is to make my own chocolate! I used some local raw honey in place for the maple syrup and sprinkled in some uncooked quinoa, which added an extra bit of crunch! I didn’t really have to spread it out though, it was runny enough to do that on it’s own. Thanks for the recipe! I can’t wait to try this recipe! As always, the pictures look beautiful. I think I might add goji berries or some other dried fruit to the toppings for some color. Thank you for the recipe Angela!! I simmered the coconut oil with medical marijuanna at a very low heat for 30 minutes and then followed the recipe exactly. It turned out beautifully, tastes delicious and very effective! I just went walking , hiking for 2 hours to get in shape , and hell ya ! I’m gonna make myself some healthy chocolat bark !! BAHAHHAHA….the produce stickers on the counter and loading the dishwasher….I thought I was reading about myself. I throw the dishes in there any which way and then hubby gets home and rearranges it ALL! It’s just a long-running joke now that I am the worst dishwasher loader in history. Yum!!!! I’m training myself to like dark chocolate and this was the perfect start!!!! I didn’t have hazelnuts so I used chopped craisins and dried blueberries and it was really delicious! I just got your cookbook as well and have been reading it like a novel at night! Thanks for another great recipe!!! My husband and I are the opposite of you and Eric! My husband leaves glasses on the counter ABOVE the dishwasher which drives me insane and then when he actually does put items in the dishwasher, he loads it like he’s in someone else’s house so I have to rearrange the glasses every time. Also he opens mail and leaves it on my chopping surface which grosses me out. I have no quirks (except sometimes I forget to fill the brita and occasionally wash the cat food can lid and hide it under a pile of dishes). Hey, no one’s perfect! This was SO incredible!!! One of the best “chocolate” barks I’ve ever had! Thanks for the recipe, Angela. My biggest kitchen quirk is that I need to clean as I go. A messy kitchen give me scatter brain. So I am always stopping to wash a dish or put stuff away. We just moved across country and are currently staying in a very small apartment where I only have about 3 fee by 2 feet of total kitchen workspace! I have been very scatter brained! Thank you for sharing this recipe – I am really looking forward to trying it! As far as kitchen quirks, I must admit that I also have to arrange the dishwasher my way. It bothers me when my roommate stacks her dishes inefficiently. I actually enjoy organizing the dishwasher, haha! In my home, I’m the one who always reloaded dished loaded by my husband. I guess there is dishes-re-loader in every home :) lol! Angela, these coconut bars look amazingly delicious. I often make bars with store bought chocolate. This time, will sure try it with coconut oil and cocoa at home. thanks for sharing! I have made and consumed two batches of this chocolate bark since it was posted! So delicious. The second batch I added dried cranberries and left off the coconut. His quirk would have to be using every dish we have when he cooks! Never fail, on a day he cooks, I have two loads of dishes to do. My boyfriend thinks I am the messiest cook! I always throw my empty packages, baggies and cut off ends into one side of the sink – it makes it easier to throw it all away at once! Funny part is my adult daughter does the same thing and drives her boyfriend crazy too! I spread out and probably use more utensils than necessary but what comes out tastes great and I am a cheap dishwasher! In my house my husband is also super organized but I am still the one who insists on the dishwasher filled a certain way (he also tends to run it only half full which drives me nuts. As for the recipe, this looks so good! I have made a similar chocolate bark recipe which was very tasty but yours beats it hands down! Thank you for sharing. I am so glad I found this blog! Your recipes are just great! Thanks for being awesome! i wonder how i would be able to make this sans sugar… im doing this whole no sugar added thing and it includes natural sweetener. any ideas? A large portion of the honey just sank to the bottom of the pan and didn’t incorporate into the bark so the bottom of the bark was way too sticky when I went to take it out of the pan. I guess it is a result of the thicker consistency of the honey, but another commenter said he used honey just fine? I will try to make this again but will try to find another less stronger sweetener to use than maple syrup. Any suggestions? Oh dear god I am definitely super messy in the kitchen, especially as I always seem to have so much going on at once it can start looking like a war zone! Hahaha I definitely think it’s a guy think, my partner is the same with our dishwasher and has many a time unloaded what I’ve done and re-loaded to get it right! I just wanted to say that I bought your cookbook a couple of days ago and just love it. I have always felt exactly the same as you did about tempeh, so I’m in the process of baking your recipe – the marinade is delicious and I’ll use it for other things. I made the burgers yesterday: amazing! I added some chopped walnuts, liquid smoke, and wild garlic leaves. These are the only really yummy veggie burgers I’ve ever eaten. 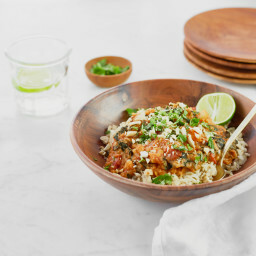 It’s lovely to have a vegan cookbook which is neither incredibly refined (and mostly based on young green coconut meat, which seems to be unavailable – even online – ion the UK) nor beige and worthy. Just really lovely fresh, attractive and delicious food, which I want to make every day. You’re a star! I would be beyond ecstatic if you could do some ‘dessert’ recipes which have no sweetener of any sort, for us diabetics, and which also don’t have dried fruit, dates, etc., as these are forbidden fruit, quite literally. Okay just got around to making the bark as part of my Oh She Glows 30 day challenge! This was very tasty, although I had issues with it setting. Did anyone else experience this? Some of the maple syrup separated and dripped out from when I took it out of the pan. It was a tasty clean up though ;) I also liked the addition of nuts in it, to add some crunch. Toasted coconut on top was divine! I rate this a solid 4 stars out of 5! I rarely ever comment on recipe blogs (despite spending SO much time looking at them), but I had to for this one. I’m not vegan or vegetarian, but I do love trying new foods and incorporating healthy variety into my diet so I’ve been spending a lot of time on OSG. 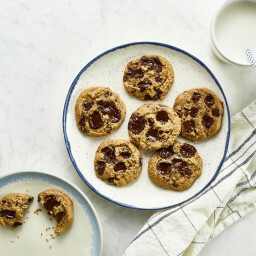 Chocolate in particular is my soft spot, so I’m always excited when I see a recipe that looks like it can curb my sweet tooth without making me feel too guilty about what I’m putting in my body. This treat is DELICIOUS. I omitted the almond butter and coconut because I didn’t have any, but even still this turned out fantastic. You still get a coconut flavor from the oil itself. The texture is great – the chocolate part is very smooth and not gritty at all, and it literally melts in your mouth. If you’ve ever had that chocolate shell sauce you pour on ice cream and then it hardens, this bark actually reminds me of that. Also, the pinch of salt helps balance out the sweetness – sooo good! Tried this recipe over the weekend and absolutely loved it! Definitely needs to remain in freezer as it is quick to melt. I subbed pecans for hazlenuts and it came out great! If you’re into sea salt and dark choco, add more sea salt. It really brings out the nutty flavors! This is so funny, Angela! Growing up, my dad was crazy particular about how the dish washer was loaded, and was particular about all the cuterlery facing stem down so the “used” part got a good wash.
My “roommate” or fiance is HORRIBLE about taking his socks off and leaving them wherever they are removed! It’s very cute that he can’t stand to have stifled toes, but awful seeing evidence around the apartment!! Errmergerd im never eating normal choc again this is insanely good and so easy !!! …which brings me to my other point: I also tried the recipe substituting equal parts cocoa with carob powder. It was good but oddly much chewier and all the coconut oil couldn’t be absorbed properly so it sort of sat on top (still yummy!) Makes me wonder if I put a little less coconut oil and a few other yummy things (chia? ), this could almost become a snack bar-type thing. Something to try?? They always turn out SO good. Thanks for sharing this! wow this looks amazing! 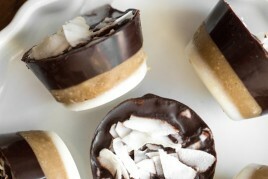 I love the chocolate & coconut combo :) can’t wait to make a batch! 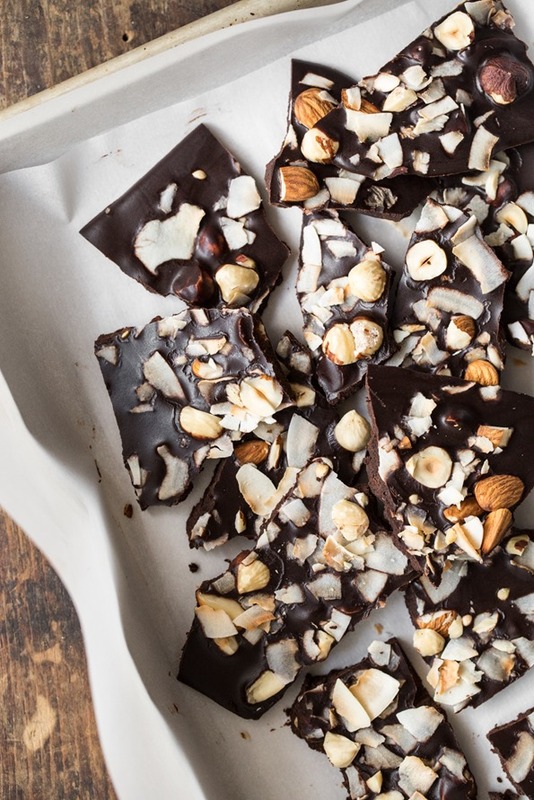 Your Crazy Good Coconut Oil “Chocolate” Bark recipe makes me crave it. I’m really excited to make my own. Perfect alternative to the “regular” candy bar I buy. Nutritious snacks are delicious thanks to these recipes. My biggest kitchen quirk is probably that, when I’m cooking, I like to spppppppread out all of my ingredients on the kitchen island/counters. So, for maybe one batch of granola, I take over an entire countertop. I don’t even realize I’m doing it until someone else tries to make lunch and I realize they have no space…oops! Oh, some of these comments are just priceless! My quirk- Probably an attempt to use as few dishes as possible, which results in me shopping vegetables in the bowl instead of on a cutting board, for instance. I have tears in my eyes from laughing so hard. I thought I was alone, I am so glad that are others who live with The Dishwasher Police. I don’t bother even attempting to load the dishwasher anymore. When I have tried, my husband will shake his head, chuckle and say “You are so funny. Good try.” And then unload and reload the whole thing. It has a fancy cutlery compartment. When we bought it, he read the manual and suggested I do the same, so that I could learn the correct slots for spoons, knives and forks. I think life is too short to read dishwasher manuals. He can have the dishwasher and load it his way. Now if we get on the topic of how to properly fold towels, that is another story…. I made the bark tonight and I can honestly say I think it is much better than all the dark chocolate I have tried and without the heavy milk and dary and processed sugars. So healthy for you and yet so amazingly delicious. Thank you for your recipe!!! I made the bark tonight and I can honestly say I think it is much better than all the dark chocolate I have tried and without the heavy milk and dairy and processed sugars. So healthy for you and yet so amazingly delicious. Thank you for your recipe!!! My thing is fridge and cupboard organisation. Everything has its place, and has to be in that place! (In the fridge – dairy at the top, meat at the bottom!) My boyfriend never remembers this and drives me cray cray. I cant let him unpack the food shopping cause its just CHAOS in the cupboards. Reading these comments is making me laugh! But I definitely agree with you Angela- I’m effective and time-saving while I leave the doors open. But…. I have a tendency to leave the doors open AFTER I’ve finished…. whoops. 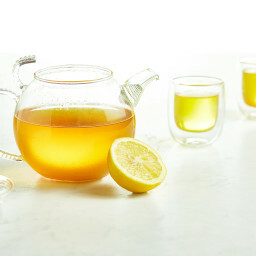 I finally made this last night — such a big hit with my guests, and so easy! I followed the chocolate recipe as you had it, but used other nuts I had on hand – almonds, pistachios, and coconut. the chopped pistachios gave a lovely colour to the mix. Everyone asked for the recipe! I’m neurotic about the dishwasher! everything in the right place – large plates go in the front, short plates in the back, tall glasses on one side, shorter glasses and coffee cups on the other. My other quirk is putting things back in the cupboards. All tupperware must be stacked by shape (round together, rectangular together, etc.) in size order. All lids are similarly stacked and placed in a special ‘basket’. Same with pots and pans. And don’t get me started on bagging the grocery shopping. My kids have been trained – all dry goods in one bag, cold goods in another, same for produce. Raw meat never gets mixed with anything other than raw meat. My kids call me ‘Sheldon’ from The Big Bang Theory! With it being chocolate it looks and sounds naughty but reading what’s init it actually sounds quiet healthy and great to take as pieces to work for a snack or for when you have friends over. Nice to see you have included other alternatives to add in rather than just using nuts. You have put a tip to make it nut free and that means taking out the almond butter, what would you use then to make the chocolate? Just ordinary butter? This was a hit with my picky boyfriend! I just made this and I have to say it’s amazing! I added a tbsp of maca to mine and substituted the hazelnuts for macadamia! Turned out beautifully, I’ll be making it again for sure! I just tried making this using cacao nibs blended to a powder with my coffee grinder. The oil and powder separated once I put it on the cookie sheet and now that it is frozen, the oil rose to the top and the cacao powder formed a layer on the bottom. Is this because the cacao nibs weren’t blended fine enough? Or is it because I used 1/2 cup solid coconut oil (would it have been different if I melted then measured? I accidentally rated this recipe one star! It is definitely a five star recipe, I just have to change my approach. But I was wondering, for the recipe, is it sweet and mellow tasting enough to be kid friendly? For young kids, I don’t want to give white sugar filled chocolate but a healthy treat is always nice. Or does it have more of a dark chocolate taste “adult-only” taste? I know I am very late to this conversation, but I had to chime in and say that while I don’t think I’m nuts about technique or anything, my husband is TERRIBLE at loading the dishwasher. He consistently puts things in there that shouldn’t go, he will put plates and such in facing away from where the water comes out, so they can’t/won’t get clean, and he often loads dishes and plates so they clang against each other and get chipped! But he’s even worse about unloading. IF he ever does it (and that’s a big if), he doesn’t look at anything to make sure it’s actually clean before he puts it away. Our dishwasher never seems to clean everything 100%, so there is usually at least one glass or fork that has gross stuff all over it. But he’ll just put it in the cupboard with the others, instead of setting it in the sink to be rewashed. So. Gross. FYI…..most restaurants don’t refrigerate condiments, they are left overnight on the table! Looking forward to trying your creation. Yup – made it! Making a double batch as I type – so good! I am the organizer at my house and everyone else is very disorganized! It’s like trying to eat Oreo’s and brush your teeth at the same time! I love the flavor coconut oil gives my foods! I am going to use these delicious chocolates as teachers gifts for the holidays this year. Thanks for the great recipe! I’ve been using Angela’s recipes for cooking and baking things for years from this blog and realized I should probably start commenting! I decided to make this chocolate because everyone at work – myself included – seems quite addicted to low quality candy (like left over Halloween candy) which tends to just leave me feeling kind of gross after a sugar high. Not wanting to break the fun tradition of eating candy at work, but rather to enhance the experience, I made this lovely chocolate to take to work this week. We’ll see how long it lasts! It’s very tasty! I had no problems, but substituted honey in for maple syrup as I ran out. I think it would be fun to play around with ingredients. Orange pieces or orange zest? Raspberries? Strawberries? Its safe to say I’m addicted to making chocolate after making this. Thanks for the recipe! This recipe with Virgin Coconut Oil goes to my cookbook. If you used 80% to100% dark chocolate, instead of cocoa powder, it wouldn’t melt when out of the fridge. The difference would be that you would need to temper it – cool the entire mixture over some ice or a bowl of very cold water (or even a bag of frozen peas) & stirring continuously until it reaches just above room temperature before pouring into bark. Some chocolate companies are making chocolate with maple syrup or coconut sugar now instead of cane sugar (like Zazubean’s 80% chocolate bar), which would be a great alternative. Great recipe! I will have to try it! What’s your take on the incidentals that sometimes end up in the background of the photos we mean to take? Why don’t you respond to a single comment regarding this recipe?!?!?!?! Funny you should talk about your husband in kitchen in the blog post…I found this recipe because MY husband (RANDOMLY) decided while I was at the gym that he wanted to make homemade chocolate. He barely cooks, and never has looked up a recipe in his life, and I promise I made no mention of wanting sweets or chocolate….but when I came home this beautiful chocolate bark was in my freezer. AND, absolutely NO evidence in the kitchen that he was even there!!! he cleaned up impeccably. So proud. Anyway, it was AMAZING!! Can’t wait to get home from work and eat more. I discovered this website looking for recipes for my cousin who was cutting meat out of her diet. I am always looking for healthier options myself. I saw this recipe and had all the ingredients on hand so I tried it. I absolutely love this. It is delicious. Everyone that has sampled it loves it. It is so rich and such a treat. How many calories and how much dat are in these? They look amazing! 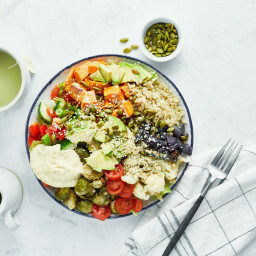 Hi Heather, I haven’t calculated the nutritional information myself, but a free online tool like NutritionData.com and CalorieCount.com will quickly give you the breakdown you’re looking for. I hope this helps, and that you enjoy the bark if you give it a try! I have to come clean- I am the dishwasher nazi in my house. And I must say that, as excited as I am about the recipe, I am DYING to know how he loads the dishwasher. I even started to type dishwasher when I meant to say chocolate before. I know this is totally nuts. Hi Angela! I just made this nut free but it seems to not be able to break, just bend. It has been in the freezer for an hour. Any feedback? Thank you! so I just tried to make this a second time. I say tried because the recipe failed again! I want SO much to love this. The first time I used honey and it didn’t incorporate into the chocolate and ended up as a sticky blob on the bottom of the pan when I removed it from the freezer. The second time I used maple syrup and I KNOW it was thoroughly blended, however when I took it out of the freezer the maple syrup had ended up on the bottom separated from the coconut oil chocolate mixture as well. I know its not a consistency issue, as maple syrup is much thinner than honey. It still has a fair flavor but it’s not sweet enough because the sweetener separated from the final mixture. WHAT am I doing wrong? no one else seems to have run into this issue and I’m not sure why. Hi Marie, Apologies for my long delay in getting back to you on this, your comment slipped right by me! I haven’t experienced this issue before, and I’m sorry to say I can’t quite think of a reason why it’s happening. My one thought was that it might not be “emulsified/mixed” enough. I would make sure to whisk it vigorously just in case that might be the reason….but it sounds like you did that! I am having the same issue…I want this to turn out well but the maple syrup ends us at the bottom and the coconut oil dry white on top! why is it separating? Hey Monica, I’m sorry for the lengthy delay in getting back to you on this. Unfortunately, I haven’t experienced this issue before, and I can’t quite think of a reason why it’s happening! My one thought is that it might not be “emulsified/mixed” enough. I would make sure to whisk it vigorously just in case that might be the reason. Absolutely amazing chocolate bark!! This recipe is a keeper!! Thank you for sharing. Happy you enjoyed it, Darla! Hey Annie, I’m sorry to hear this! I haven’t experienced this issue before, and I can’t quite think of a reason other than it might not be “emulsified/mixed” enough. I would make sure to whisk it vigorously just in case that might be the reason. 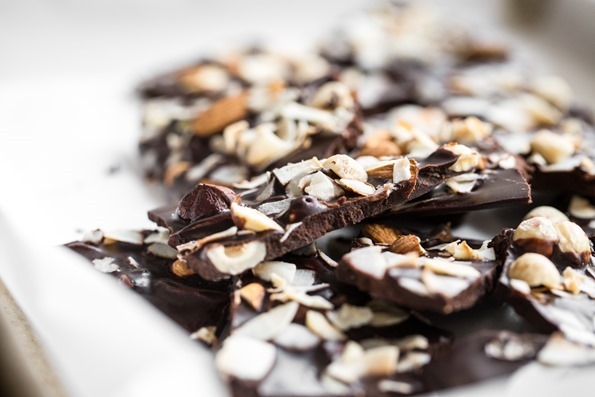 I am allergic to coconut oil are there any chocolate bark recipes without coconut oil? Hi Susy, I haven’t tried it before but I wonder if cacao butter might work? Damn, my live-in boyfriend can’t even rinse a bowl before he leaves it in the sink right next to the dishwasher. Side note – I need to make chocolate bark this weekend. I finally tried this today, and it was delicious…but mine, like Hannah’s had the maple syrup like in a separate layer….Does anyone know why that would happen? Thanks! I found this recipe on while I was doing sugar free January–finally made, it lol….March 11th! !